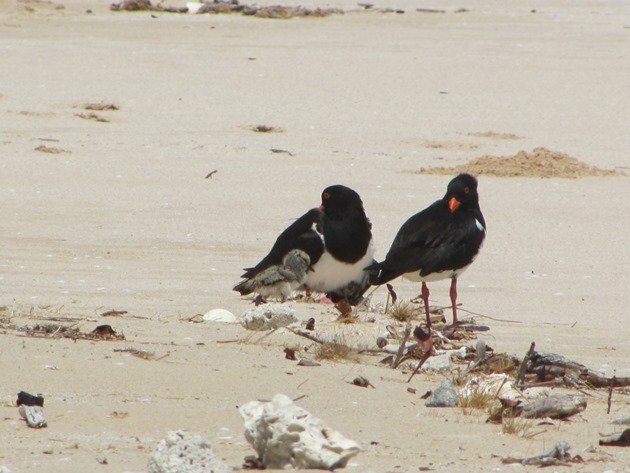 This year we have continued to monitor the breeding of several pairs of Pied Oystercatchers along the coast in Broome from Gantheaume Point to Willie Creek on the south side. The first eggs were laid in the first week of July, which is the case each year. The eggs take 28 days to hatch and it is then at least 35 days before the chicks are developed enough to fly and there have been problems with predation as in other years. It is now September and most pairs have laid at least two clutches of eggs due to predation of either the eggs or the chicks. This species are long living and so the population appears to be sustainable at this stage despite the predation. One particular bird in our area is at least 24 years old and has maintained the same territory for many years. Some birds have given up their territories and/or their partners over the years that we have been observing them, though. 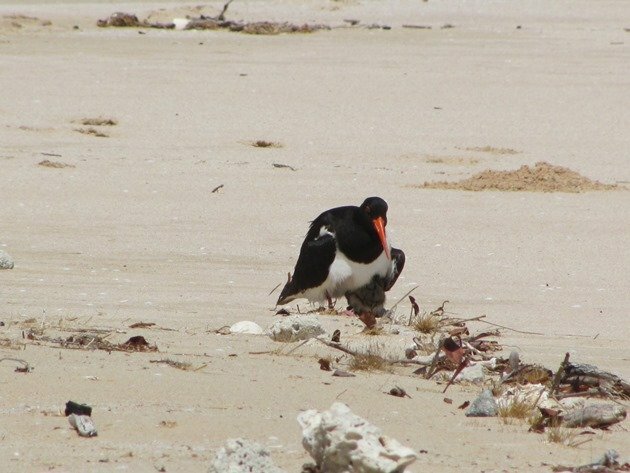 The Pied Oystercatchers are actually incredibly predictable when it comes to the dates that they lay eggs, the locations that they choose and the various strategies that each pair use in order to protect their young. The pair I wrote of last year that had three eggs used exactly the same nest site this year and also laid three eggs on their second attempt. They are the only pair in our area that lay three eggs, with all other pairs generally laying two eggs and sometimes only one egg on their second attempt. We have never had a pair succeed in raising all of their chicks and even to succeed in raising one takes a lot of effort because they are so dependent on their parents. They also appear to take more risks as they develop and this can be to their detriment. 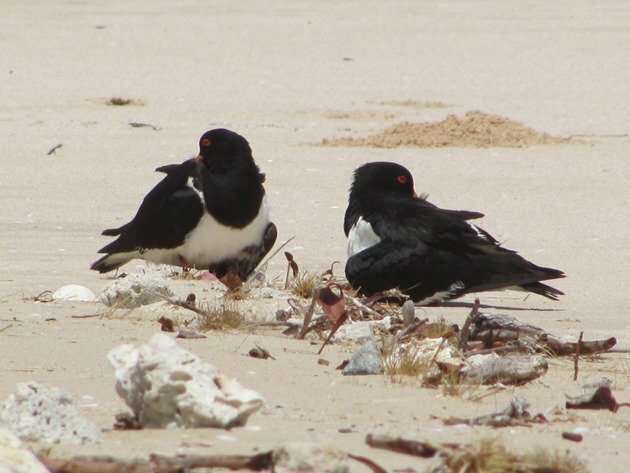 One pair of Pied Oystercatchers take risks by nesting in one of the busiest areas of Cable Beach, the nudist area just north of the rocks. They have recently hatched their two eggs having lost the first clutch of eggs just a few days before they were due to hatch. They laid a second clutch within a week and they then sat for another 28 days sharing the sitting duties. 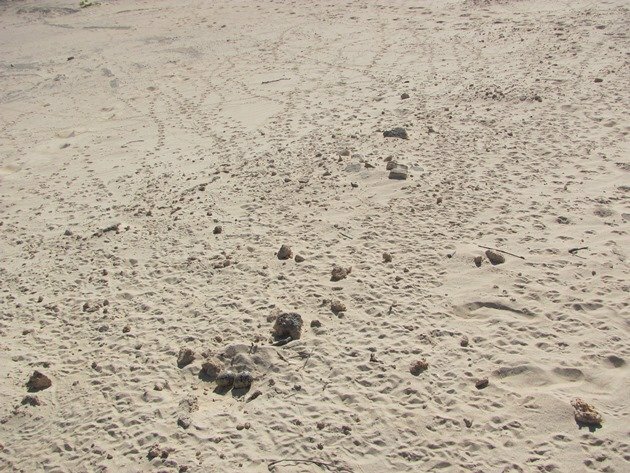 The strategy that this pair use is to lay eggs in a busy area which has good views of the surrounding area, which means watching nudists, camel rides, vehicles on the beach and everything else that goes on! 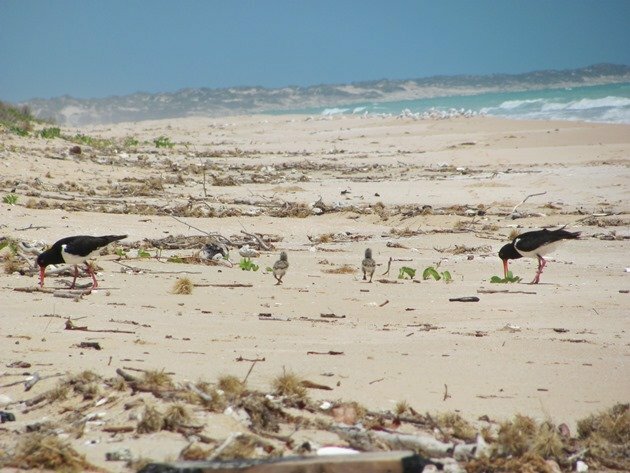 They then move the chicks within two days of hatching through the dunes system for about 3kms/2 miles over several days to get to an area opposite a good reef system where there is ample food. Last year it was successful for them on their second attempt and their first success after many years of trying. Every time someone goes near the nest the birds walk off to distract the person and try to lead them away. Sometimes they both leave the nest to feed anyway, because with the warmth from the sun the eggs will not get cold and often the birds are shading the eggs rather than keeping them warm. All of their footprints are very distinctive. 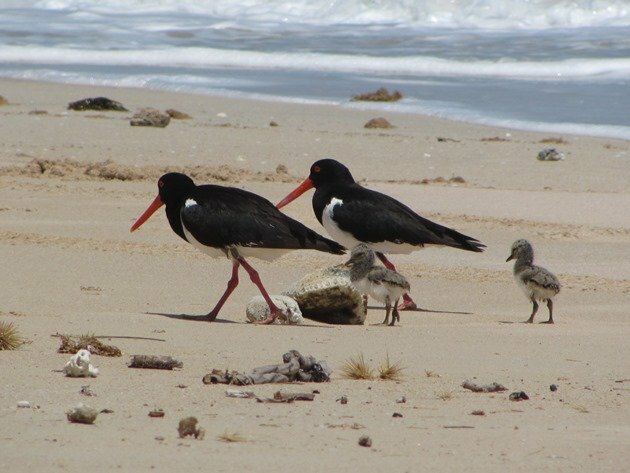 Once the Pied Oystercatcher family had made the move to the north to be closer to the reef and the high quality food they were less disturbed by people and cars, though there are still risks of attack by Black Kites, Brahminy Kites and White-bellied Sea Eagles. The parents will either defend the chicks individually, whilst the other shelters the chicks or they will both fly up at the raptors leaving the chicks hiding amongst beach debris or amongst the vegetation. 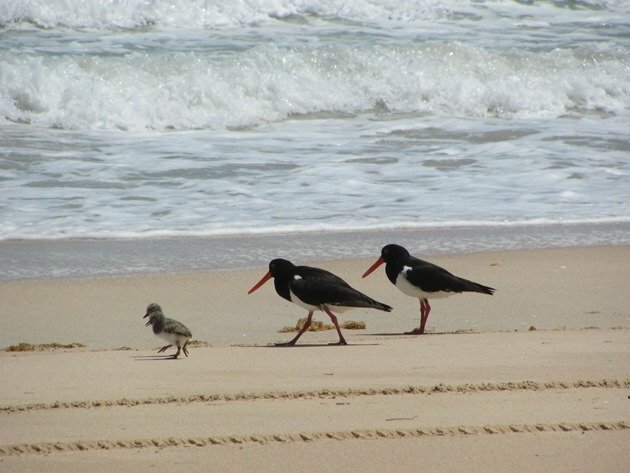 We were in a privileged position this week when we were able to sit with the Pied Oystercatcher family. Once you understand the distance that they believe to be safe they are very accepting and will walk around you and sit with you. The chicks do not always stay very close to their parents and will wander or just sit beside beach debris and reject food when they have had enough to eat. Often one parent will wander through the high tide area looking for food or along the edge of the sea and carry food back. They can be seen washing the food before they feed the chicks. There is currently a lot of natural debris in the high tide area after some very high tides and very rough seas. 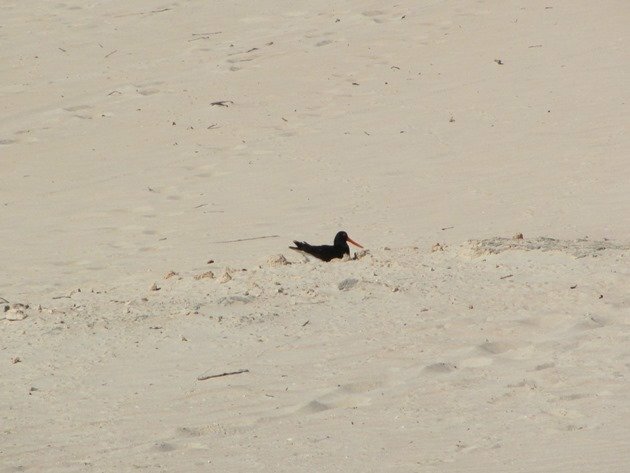 The Pied Oystercatcher family walked by us and the chicks were also poking around in the sand learning the art of finding food. At high tide there was little to do but watch and wait for the tide to drop back, so we all did that! One chick went under one parent’s wings at first….. 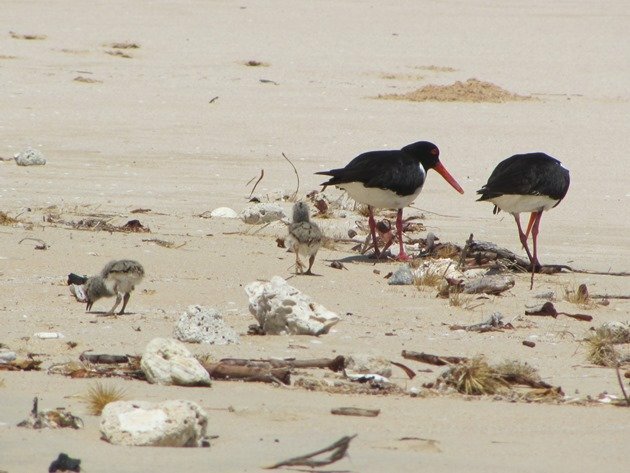 The second Pied Oystercatcher chick attempted to fit under and then the parents took one chick each under a wing to sit out the high tide. 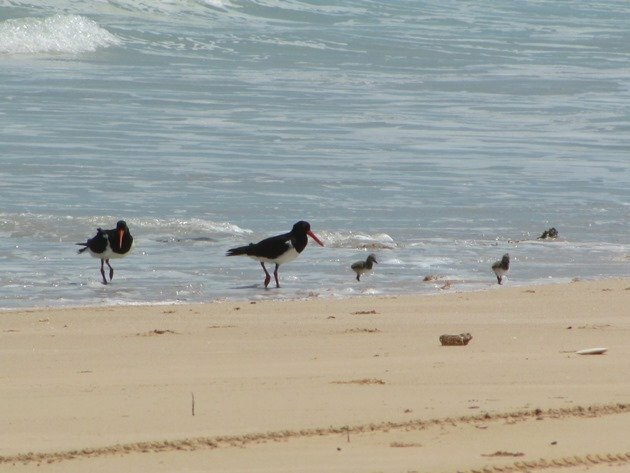 Once the tide had fallen the Pied Oystercatcher family set off again in their search of food and headed along the beach. We waited until the sea had dropped back far enough so we could freely walk around them without causing any alarm, because they had walked around us prior to high tide. We were more than grateful for the privilege of being able to spend time in such close proximity to them all. 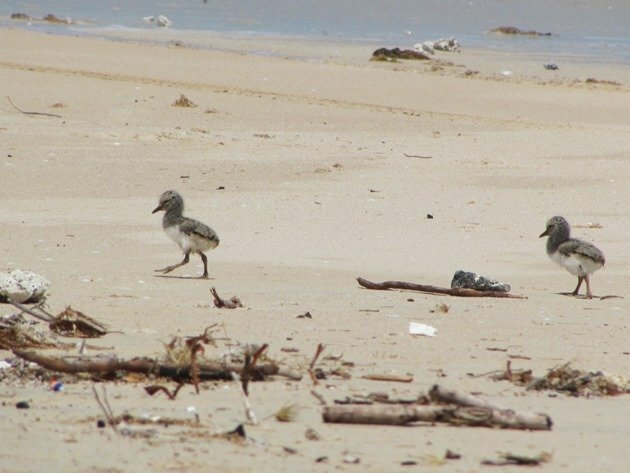 Hopefully over the next few weeks they will succeed in raising at least one of the chicks, but we are also realistic and over the years we have studied this species around Broome we are aware of the many dangers present. They are also very good at hiding as we have learnt over the years! Those are some of your most wonderful images. Thanks for sharing them with us. So when are you coming forward with your pictures of the blue-fronted fig parrot? Thanks Jochen! 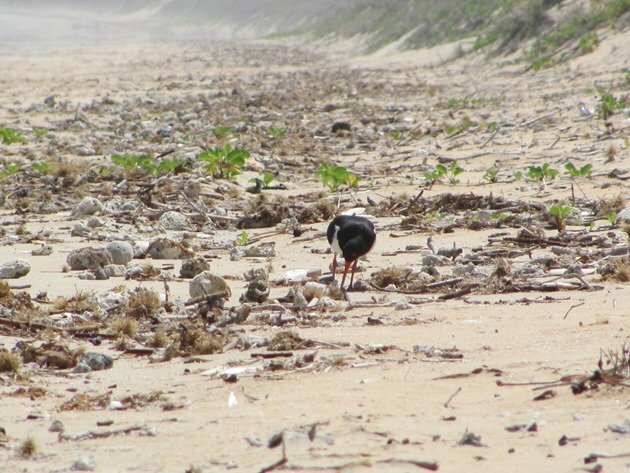 I do have thousands of Pied Oystercatcher photos and it is hard to choose what to share and I don’t want to write about them every week and have people think I am obsessed with the species! If I got off the beach I may see a blue-fronted fig parrot and add it to my year list! Only 92 days left this year to top up my list…..aghhhhhh!